Privacy is valued in the crypto-space as it provides anonymity and prevents the financial details of users from being made public. There are several privacy coins available today. All of these coins implement different infrastructures in order to achieve privacy. As interest in the crypto-space rises, the need for discretion, in currencies as well as smart contracts, will rise too. In direct contrast to this, there are services who work with government agencies and institutions to track digital currencies and deanonymize blockchain transactions for compliance purposes, fraud detection or to prevent money laundering. Traditionally cryptocurrencies provide a public transparent ledger which can be viewed by anyone. For example, Bitcoin transactions are pseudonymous in the sense that only the wallet addresses (instead of the identity of a person) are known throughout the transaction process. However these transactions are not truly anonymous as the transactions are visible on the blockchain and can be clearly linked to the user’s wallet address. Therefore, the need arises for coins which obscure the link between a sender and a receiver. Coins which provide such a solution are known as Privacy Coins. Demand for privacy in the crypto-space exists to benefit users who want their financial details to remain private. 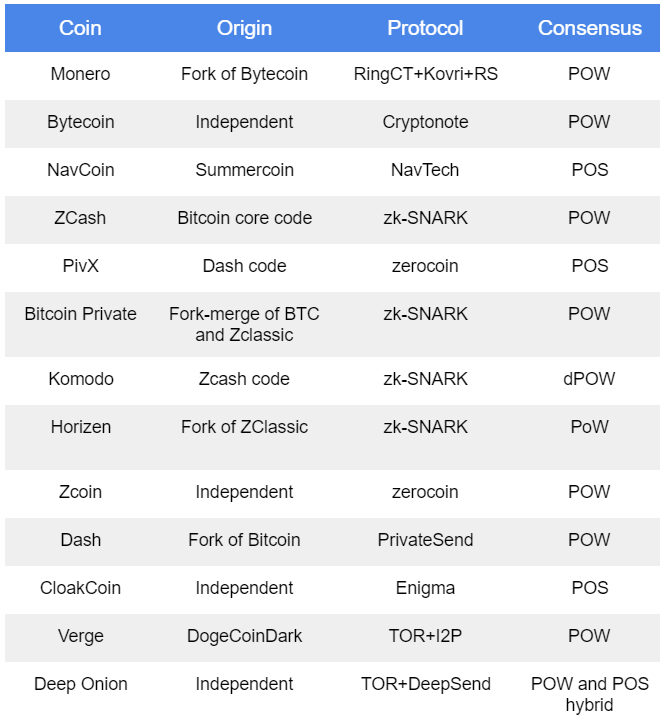 We’ve categorised privacy coins on the basis of the methodology they use to provide privacy. The most common and successful methods used for privacy are zero knowledge proof, CoinJoin, TOR and other methods designed for specific projects such as Monero. In cryptography, a zero-knowledge proof or zero-knowledge protocol is a method by which one party can prove to another party that he/she knows something without revealing what that something is. ZK-SNARKS stands for Zero-Knowledge Succinct Non-Interactive Argument of Knowledge and is an improvement on zero knowledge proofs as they avoid any interaction between the prover and verifier. Zcash and its derivatives/forks (i.e. Bitcoin Private, Horizen and Komodo) inherently adopt the privacy features of zcash and use zk-SNARKs as an infrastructure for privacy. PIvX and zcoin use instead zerocoin protocol which is a different technological infrastructure based on zero knowledge proof. CoinJoin is an anonymization strategy which combines the transactions of several senders and receivers into one transaction. CoinJoin can be considered similar to a tumbler in which several users can mix their transactions to achieve anonymity. TOR is an abbreviation for The Onion Router. TOR is a free network of servers that can be used to hide a user’s IP address by randomly routing the user’s internet traffic through the complex network. It was originally developed by the US Navy to protect US Intelligence communications online. Now, it acts as a non-profit organisation endorsing online privacy. TOR is one of the most popular methods which is used worldwide to obfuscate the origin of the data. The TOR Project provides a free software that enables anonymous communication. Verge uses a combination of TOR and I2P (Invisible Internet Project), whereas DeepOnion uses TOR, stealth addresses and DeepSend to achieve privacy. Other coins are also available that work using separate, unique methods to avail privacy. For example Bytecoin is powered by Cryptonote Technology, and NavCoin implements a secondary subchain known as NavTech. Using two chains allows users to send transactions with complete anonymity. Monero, a fork of Bytecoin, has over the years largely deviated from the Bytecoin (and CryptoNote) code. Monero uses Ring Signatures, Stealth Addresses, RingCT and Kovri (look at Infrastructure Section) for untraceability, unlinkability, transactional privacy and obfuscation of IPs respectively. In addition to privacy coins, there are certain protocols and infrastructures that these privacy coins are built on or use. These are the underlying technologies that are available for privacy coins or networks that want to attain anonymity. The Zerocoin Protocol was proposed in 2013 by Ian Miers, Christina Garman, Matthew Green, and Aviel D. Rubin. It harnesses the power of Zero-Knowledge proofs to ensure complete financial privacy. With the help of Zerocoin protocol, transactions can be anonymised without going through a trusted third-party. The history of the coin is erased by destroying and minting again the coin simultaneously. The next iteration of zerocoin was called zerocash which was used in the implementation of zcash. PrivateSend is a trustless method of running a sequence of transactions (known as “mixing”) such that an external observer is unable to determine the source of funding when a PrivateSend transaction is created. Privatesend is the only technological solution based upon Dash, which provides anonymity. PrivateSend is an application of CoinJoin, a method which offers users the ability to merge transactions so that they cannot be traced back to the sender’s wallet. To understand RingCT, let’s first discuss Ring Signatures. Ring Signaturesare digital signatures which protect a sender’s privacy by making input transactions indistinguishable from one another. This is achieved by using a digital signature among a ring of multiple members. Only one of these members can authorise the transaction and the others act as decoys. When a transaction occurs, the money is sent as a group of randomly picked ring signed transactions of the same amount. RingCT (Ring Confidential Transactions) is an algorithm that pools the sender addresses together, allowing the transaction amount to be concealed. Monero was the first coin to utilize RingCT. While Ring Signatures hide the identity of the sender, RingCT hides the amount of the transaction, while stealth addresses are used to hide the identity of the receiver. Kovri is an open-source technology that hides IP addresses while transacting Monero. Kovri uses both routing techniques and encryptions to hide the IPs as well as the geographical location of transactions by creating a new layer over the internet. Bulletproofs are defined in Stanford’s research paper as short, non-interactive zero-knowledge proofs that require no trusted setup. A bulletproof can be used to convince a verifier that some piece of encrypted data is correct without revealing the data. Compared to SNARKs, Bulletproofs require no trusted setup. However, verifying a bulletproof is more time consuming than verifying a SNARK proof. Starkware Industries was founded on January 1st, 2018 by Alessandro Chiesa, Eli Ben-Sasson, Michael Riabzev, and Uri Kolodny. Starkware aims to improve scalability and privacy in blockchains by using STARK (Scalable Transparent (“no trusted setup”) ARgument of Knowledge) technology, providing cryptographic proofs that are zero-knowledge, succinct, transparent, and quantum secure. Compared to SNARKs, STARKs don’t require a trusted setup, although the size of the cryptographic proofs becomes comparatively larger. NuСypher is a decentralized key management system that provides the ability to securely store and transfer encrypted data in public blockchains such as Ethereum, Qtum, NEO, as well as in distributed file systems and storage solutions such as IPFS and Storj. In order to remove the reliance on central key management service providers, Nucypher uses Proxy re-encryption. This encryption method is an interesting solution because it allows encrypting the data with a proxy server acting as an intermediary (miners in NuCypher network) without actually disclosing the data during processing. Privacy layer refers to the layers for implementing privacy in smart contracts ( compared to the infrastructures discussed earlier which were focused on currencies). Smart contracts currently lack both anonymity and obscurity. Recently, a lot of new privacy oriented smart contract platforms have emerged like Enigma, Origo, Oasis and Covalent . Keep is a project that is aiming to provide confidentiality to Ethereum smart contracts by creating an off-chain container for private data. In this way, private data is kept protected from any vulnerabilities on the public blockchain. Today, there are also services which help to deanonymize blockchain transactions to counter money laundering, detect fraudulent activities, conduct background verification checks and follow compliance norms. Neutrino.nu, Elliptic and Chainalysis are the main projects which monitor, analyse and track cryptocurrency flows for cryptocurrency companies, financial institutions and government agencies. This overview may not be fully exhaustive and does not assess the viability of all of the above-mentioned projects, nor the legitimacy of their teams. Readers should conduct their own due diligence before using or investing in any of the listed Privacy coins or infrastructures.